I’ve always envisioned that down the road I would be able to own some antiques and pieces of art. If you look around, you can find affordable decorative pieces for not much more than modern equivalents made in China from the home decor big box stores. As part of my quest, I have started going to art and antique auctions. It is standard practice for an auction to hold “preview” sessions beforehand so that interested buyers can inspect pieces up close. These viewings are in many ways like visiting a museum with a very eclectic collection but are also way more hands-on since you are allowed to open drawers, turn over statues and handle objects (carefully of course). Even if you are not a very serious buyer, visiting an auction preview can be a lot of fun. 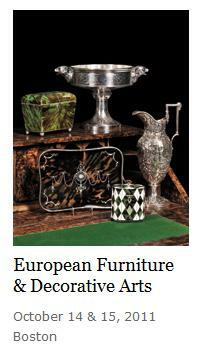 This past weekend, there was a European Furniture and Decorative Arts auction at Skinner in Boston. Overall I was impressed with the diversity of items offered. There were painted porcelain vases, chandeliers, gilded mirrors, loads of tortoise shell boxes and delicate glass pieces in addition to the usual dressers and paintings. You can flip through the catalog online or view each individual item here. 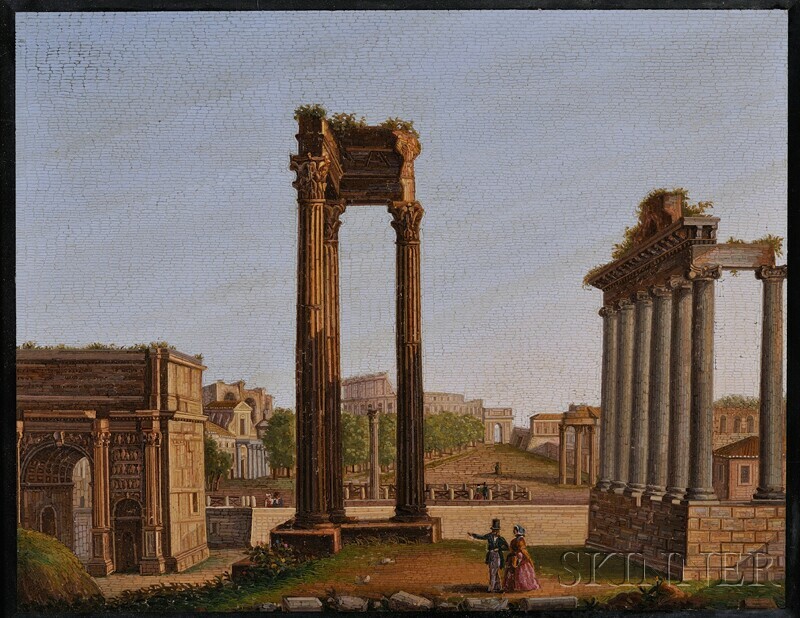 One of the obvious highlights of the show was a micromosaic depicting Rome. It was less than a foot in length but incredibly detailed. Examining it really closely, I still couldn’t believe it was constructed of inlay. It would have been difficult to execute even if it were a painting. Clearly the craftsmanship made this a rare and spectacular work of art. The subject matter was not as unique as I saw several 19th-20th century “grand tour” art examples including oils, watercolors and bronzes all with the obvious beach, castle and ruins included. Having just seen the whole range of tourist art in Greece, it’s funny to think that people have always wanted and continue to pick up souvenirs when they travel abroad. 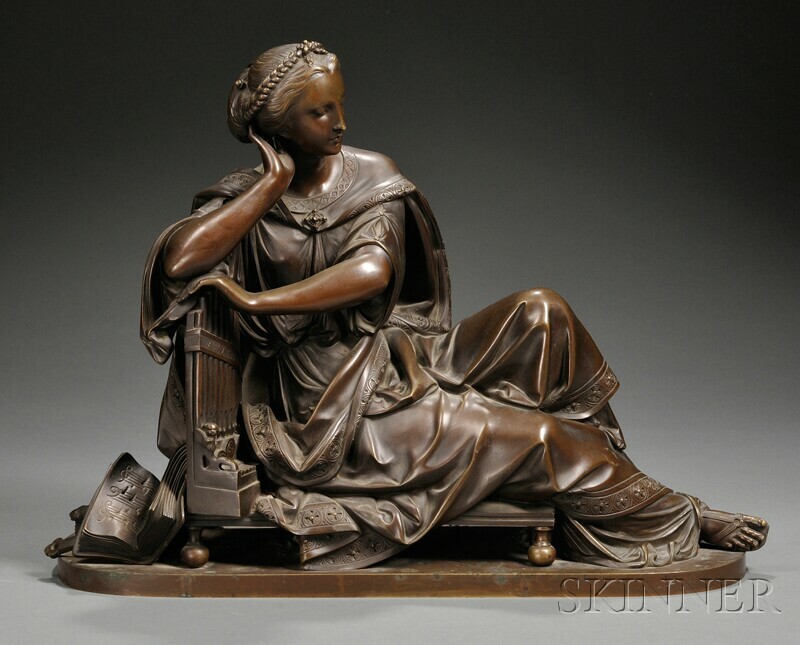 One piece that I really loved was a bronze Classical Muse by French sculptor Albert Ernest Carrier-Belleuse (1827-1887). I liked the figure’s pose and her elegant, detailed costume. At over a foot tall and two feet wide, it is a pretty substantial work of art and was probably more than I was looking for right now. I did find four items that I was interested in buying and left bids. My art budget is pretty low right now, so my bids were all under the auction estimates. If I won, then great, I would have bought a really nice piece of art and if not, there would be future auctions. I also left bids rather than bid live to make sure I didn’t get carried away! Stay tuned to see how the auction went and how I did….